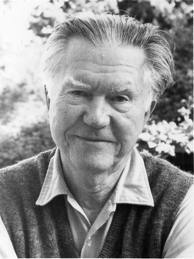 William Stafford (1914 —1993) was a conscientious objector during World War II. At that time he worked in an alternate forest service work camp, operated by the Church of the Brethren. While doing this work in California, he met and married his wife, Dorothy, the daughter of a minister in that denomination. He later spent one year teaching at a college associated with the Church of the Brethren, although the balance of his teaching career was at Lewis & Clark College in Oregon. ------just the way it was. ------"You don't have to prove anything,"
------out in the sun again. It was all easy. In 1963, when he was 48, he won the National Book Award for Traveling Through the Dark — his first major poetry collection. Despite this late start, he eventually published 57 poetry books. 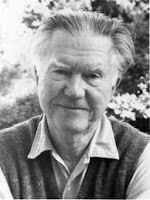 In 1970 he was appointed to the role that would later become known as Poet Laureate of the United States, and in 1980 he was named Poet Laureate of Oregon. you're trained—they told you, "Always hear both sides."